The Washington Slagbaai National Park is huge. 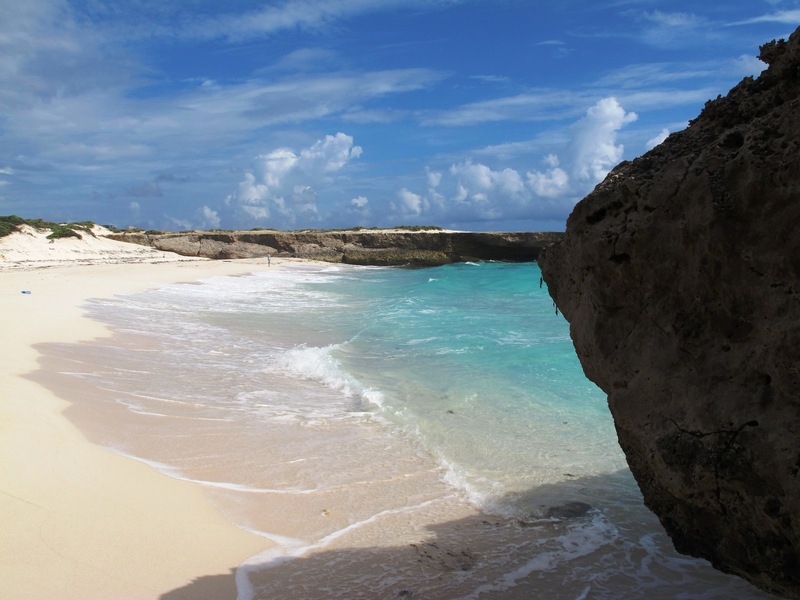 It takes up one third of Bonaire’s surface. It covers the beautiful mountainous northern part of the island. When you talk about unspo iled, this is it. Funny how your baseline on distance shifts when you live on a small island. Since it’s more than half an hour’s drive, which is as far as it gets on Bonaire, I don’t go there very often. But when friends want to see the park, I have an incentive to go. The last time was in March. With four in the car, we drive to Rincon and get on the sealed road to the park. I prefer to walk the park by car. It is much less of an effort and at the nice spots you can always get out and walk a bit. Past the entrance the bumpy dirt road begins, so we slow down and have time to enjoy the scenery. 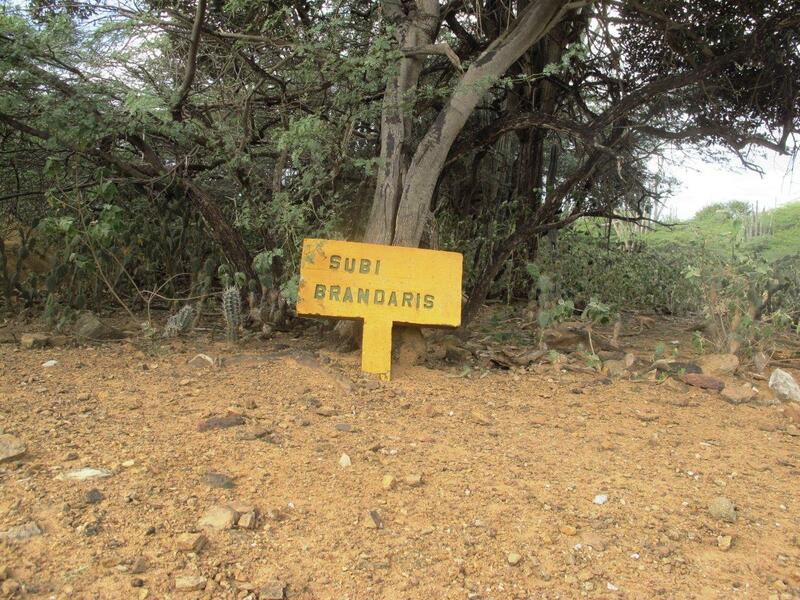 The land is littered with candle cacti, some of them almost 30 feet (10 meters) tall. Our first stop is the saliña (salt pan) Mathijs. The rainy season just ended, so there still is water in this saliña. Most of the year this pan is dry, but when there is water, there are Flamingo’s. Always a winner if you want to impress Dutch friends. Especially when, like now, there are almost a hundred of these pink birds. 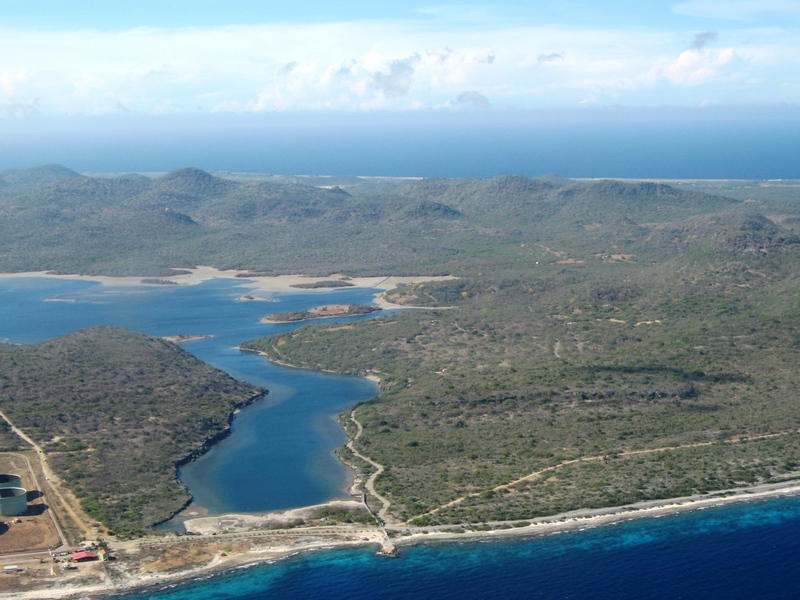 Once the visitors from Holland are appropriately impressed, we continue t he trip toward Playa Chikitu, where we can see the only sand dunes of Bonaire. We walk the idyllic beach and look at the waves storming toward the inlet. Treacherous currents can pull unknowing swimmers toward the sea. An exquisite place to get rid of someone you don’t like. I am in a mellow mood and tell my friends not to swim here. A bit further down we are road blocked. 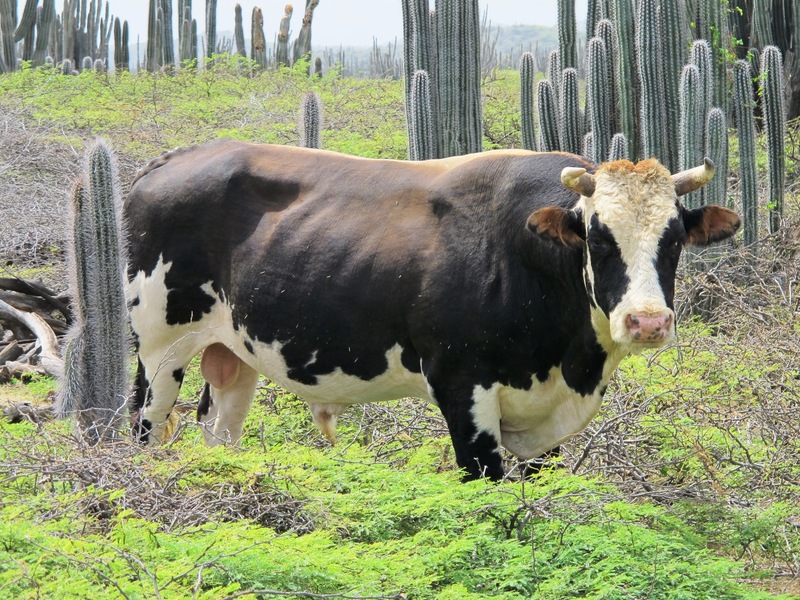 I know there are plenty of goats in the park, and half wild pigs, but I thought cattle were a thing of the past. Now a big bull is blocking our way, and he does not seem inclined to let us pass. He is protecting his wife a bit further away. With two ladies in the car, it is up to the men to move the massive bull. With tight buttocks, I slowly get out of the car, but it is Eric who is the real hero. He just passes the bull with his camera and takes pictures of the cow. Realizing he is fighting a lost cause, the bull turns away from the road. When it is behind a bush I dare to take a picture of him. The admiring ladies safely stay inside the car. 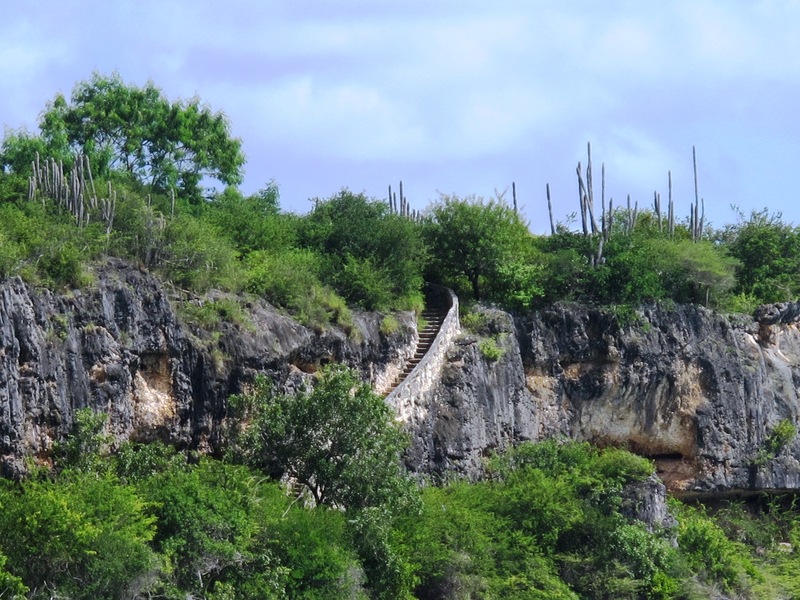 One of the most impressive cliffs on Bonaire is the eastern side of Seru Grandi (big hill) in the park. It rises vertically up to the middle terrace of the limestone hill that was formed some 400,000 years ago. A ridge about 2/3rds up shows us where the waves have eroded the limestone for a long time. The lower terrace takes us to the sea, where high waves are pounding the shoreline. There is a blowhole here that always fascinates me. Every seventh wave you can see a rainbow in the spray that blows out of the hole. The most important stop is Boka Kokolishi: this is where we have lunch! My friends have a nice picnic prepared so we carry the cooler boxes to the beach of this gorgeous inlet. Tasty sandwiches and Polar beer, why don’t I do this more often? 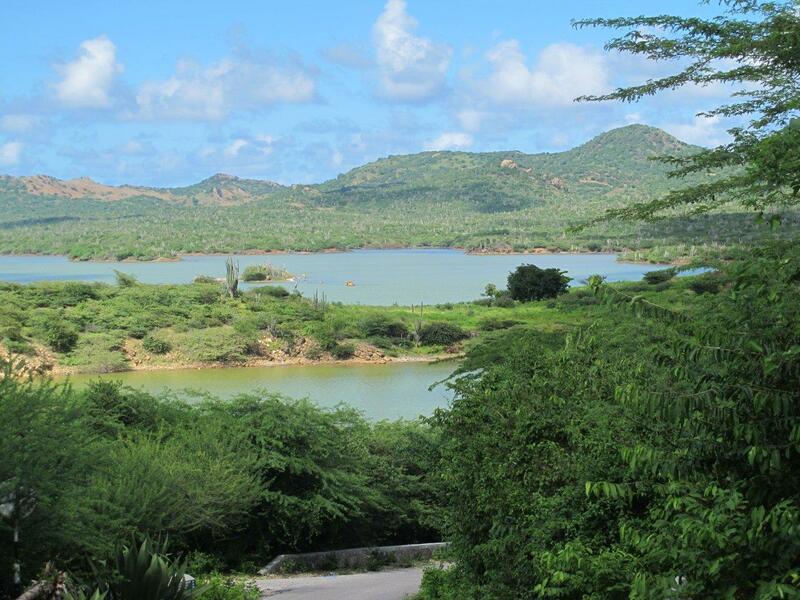 Besides a good place for the pleasant lunch, this Boka Kokolishi also is one of the most beautiful inlets of Bonaire. A so called lithothamnium bench breaks the waves half way the boka. Calcareous algae and worm shells lay an impenetrable layer in th e limestone, preventing it to erode in the breaking waves. On the landward side the calm lagoon gets overfilled with every wave and between the waves the water falls back to the sea. A place to stop and stare for hours, which we do. When I awake from my trance we have to hurry to the exit and skip the other attractive places on the road. No worries, for me there will be a next time. I started this blog about the beauty I find on Bonaire, but I postponed this episode until I could not avoid it anymore. My guest Richard pushed me over the threshold. He is a sportsmanlike guy and he told me he definitely wanted to hike the Brandaris. 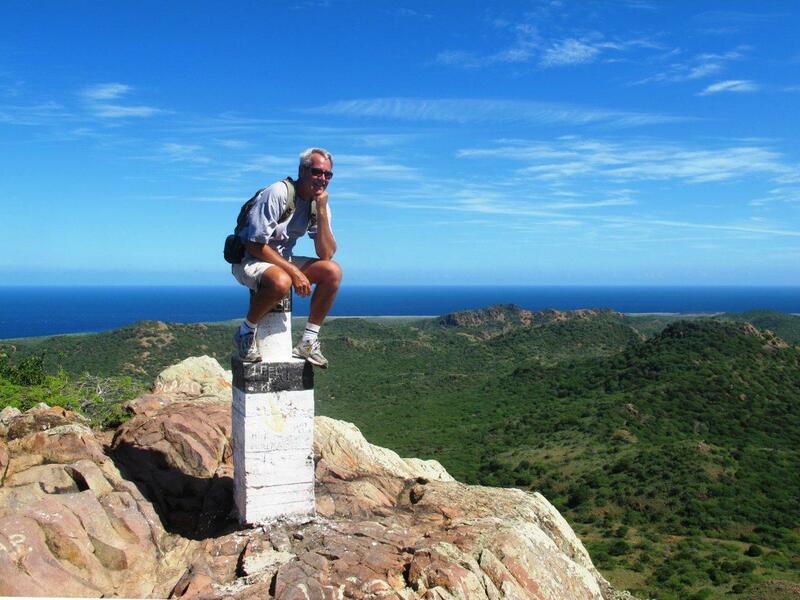 After all the enthusiastic stories he heard, he had to experience hiking the highest mountaintop on Bonaire. In a weak moment I said yes, and it was not so bad at all. When, a week later, my friend Marc and his wife Lieke were staying with me I could not say no either. I hiked it twice in a short period of time! My guests brought my sportsmanship to an unexpected height; 241 meters to be exact. You don’t want to climb the Brandaris when the sun is too hot. So we got up early to be at the Washington Slagbaai National Park entrance at 8 AM. We were the first visitors of the day. The gate-keeper at the entrance gave us a map and wrote our names in his book. I could not help wondering if he would keep track of the people who left the park that day, just in case… We entered the dirt roads of the park by car. At the Saliña Mathijs we stopped to take pictures of the Flamingoes and on we went. The park covers 1/3 of the island. On the bumpy dirt road we could only go at walking speed, it seemed like we were driving forever. The first time with Rich ard I saw a few spots I thought to be the beginning of the hiking trail. After a couple of false starts we finally found the start of the trail. Marked very clearly, just like the ranger at the entrance said. Next time I will believe him on his word. It started pretty wide, but after a while the path looked like a goat trail. The aroma of the lush bushes surrounded us. We had to watch out for the Prickly Pear cacti. The light green segments of these cacti separate very easily from the plants when the long barbed spines enter your skin. The goats did not seem to mind, they roamed the area with a segment of Prickly Pear without noticing. 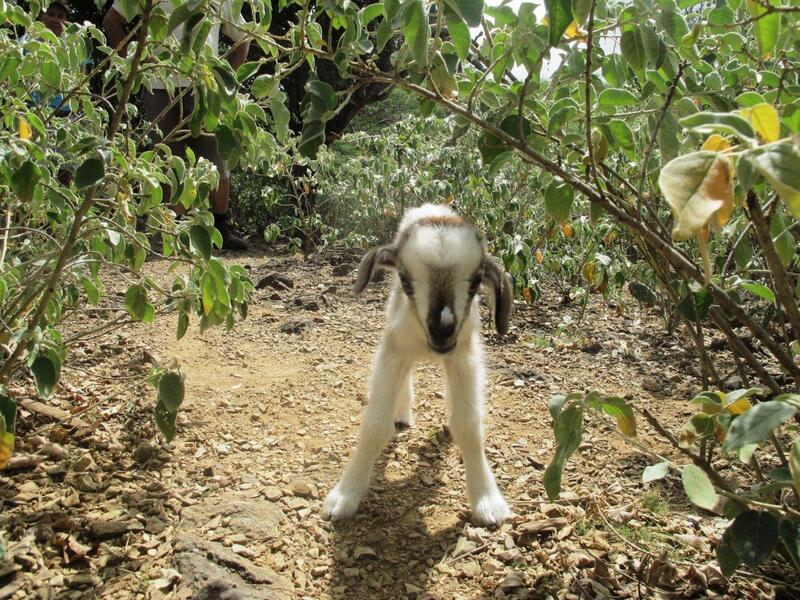 All the time we heard the bleating of baby goats yelling for their mum. We watched one mum just pretending not to hear, but when we stopped and waited long enough she decided her whining kid had learned its lesson and answered. Then she just waited until the baby goat went toward her sound and found her again. Bonaire wildlif e in a nutshell. The trail went up and down and up again. Thick bushes, green trees, the rain really did a good job this season. 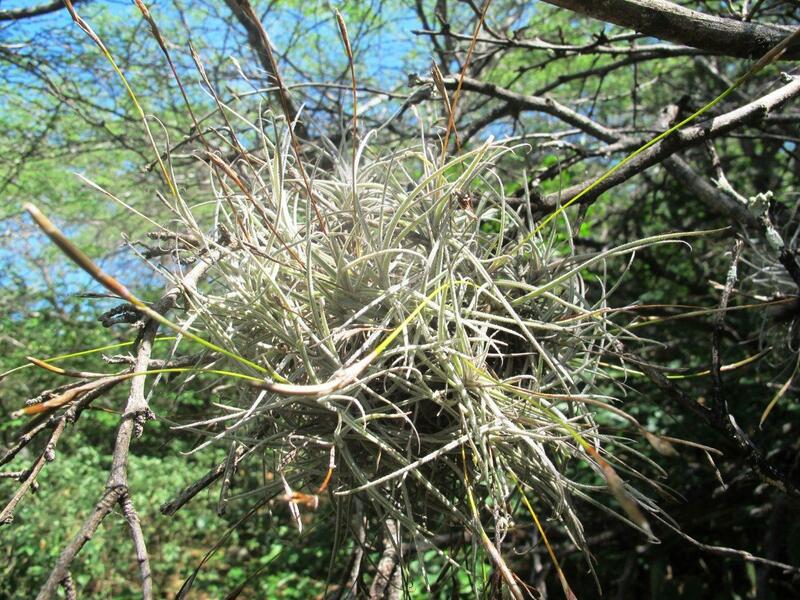 The trees seemed to be full of birds nests, but when I looked closer, I saw it were epiphytic plants, the ‘Tree Beards’. A bit further the landscape opened up. The views were stunning. Didn’t I tell you I’m a sucker for panoramic views? On this hike there were plenty, so I thought to myself that hiking is not such a bad activity after all. After forty minutes the slope got pretty steep and we had to use hands and feet to continue. I felt like a real mountain climber. Fortunately the climbing part did not last long and we could walk again. After gazing at some magnificent views on Lake Goto and on the Saliña Slagbaai, we got to a ridge and saw our goal: the Brandaris summit. Another steep rocky climb got us to the top where we let the scenery sink in. From here I did not only see all of Bonaire, but also a big chunk of Curaçao 50 kilometers away. Some say that on extremely bright days you can even see mountains in Venezuela, some 200 kilometers to the south. At this point, looking down on the Slagbaai plantation building, I could not see the steep slope going down. I experienced the awesome feeling of looking out from an airplane. We stayed at the top for about 20 minutes until all my senses were satur ated. Time to get down. It took us a bit more than an hour to get from the car to the top. Climbing down would probably take us a bit longer. 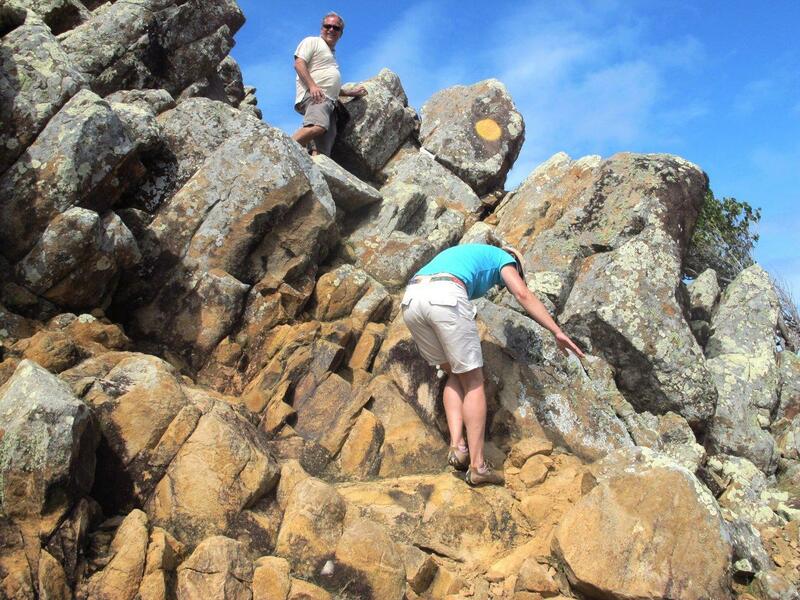 You really have to be careful descending a steep, rocky slope. You don’t want to slip and fall down, it may take ages for help to arrive here. Both times I hiked the trail we only met one other couple on the way back. It was just like we had the whole trail to ourselves. Carefully we managed to get down safely. Of course I regularly had to stop and stare at the scenery, I just cannot help being fascinated by panoramic views. I never thought it was possible, but I really liked hiking. On Bonaire there are more trails for me to discover. Just wait and see. 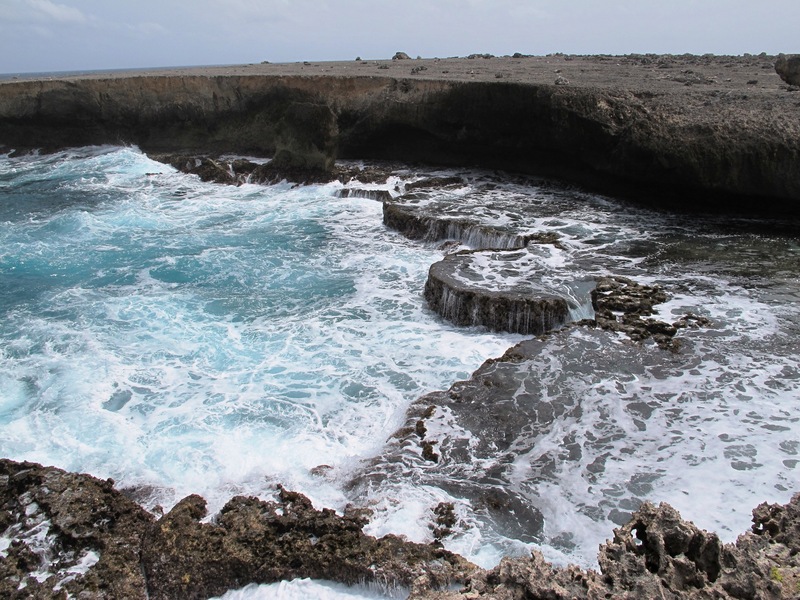 Describing the scenic winding coastal road on the Northwestern side of Bonaire takes more than one blog. This blog is the second one on the motorbike tour I did with my girlfriend a couple of weeks ago, and in the first one I described a walkway I discovered. After this very nice distraction we got on the bike again to continue our tour. Our next stop was Tolo, the area where the ‘Old Blue’ dive site is. The road is going down toward sea level again, and the cliff on the right hand side bends land inwards. The road follows the shoreline. You can see this once was a bay area, the sea level must have reached half way to the cliff and scraped big holes out of the limestone rock. At the end of the ‘bay area’ I stop at a place most people pass without noticing, a natural bridge. Maybe they don’t notice because there is no water underneath, but still it is a bridge. I intend to make some nice pictures of it today, so I transform into a mountain goat to get the best shots. Ineke, my girlfriend, stays behind to call the ambulance just in case the transformation is not success ful. It turns out to be a very rewarding climb. Not only do I get nice shots of the back side of the bridge, but I also discover this spot has a nice panoramic view of the road we just came by. After taking the shots I manage to get down without breaking anything and we continue toward Karpata. Karpata is the name of the plantation that once thrived here. Karpat means tick in Papiamentu, our local language. The Castor Oil plant gave the plantation its name: its seeds look like ticks. Unlike ticks the Castor seeds are lethal, containing ricin, one of the most potent poisons in the world. Maybe that is why the plantation buildings are in ruins. Nature slowly takes over again, but it is still worth while visiting. Decay has its own beauty, and since Bonaire is pretty sloppy with its heritage there is a lot of beauty to absorb. The courtyard is paved with Staghorn Coral. It looks beautiful, but when I realize that Staghorn Coral now is almost extinct in the Caribbean, I wish my ancestors would have been a bit more careful with it. Walking into the buildings you go back in time, imagining how life on a plantation used to be. Or how it was for the marine biologists that used the buildings only 30 years ago. After Karpata the coastal road gets wider, it is an access road to the BOPEC oil terminal. Before the terminal the road turns to the right, along Lake Goto, and gets narrow again. This is one of the first places the Arawak Indians settled in, and on the other side of the the hill we are climbing I can see why. Like me, the Arawaks must have been suckers for panoramic views. 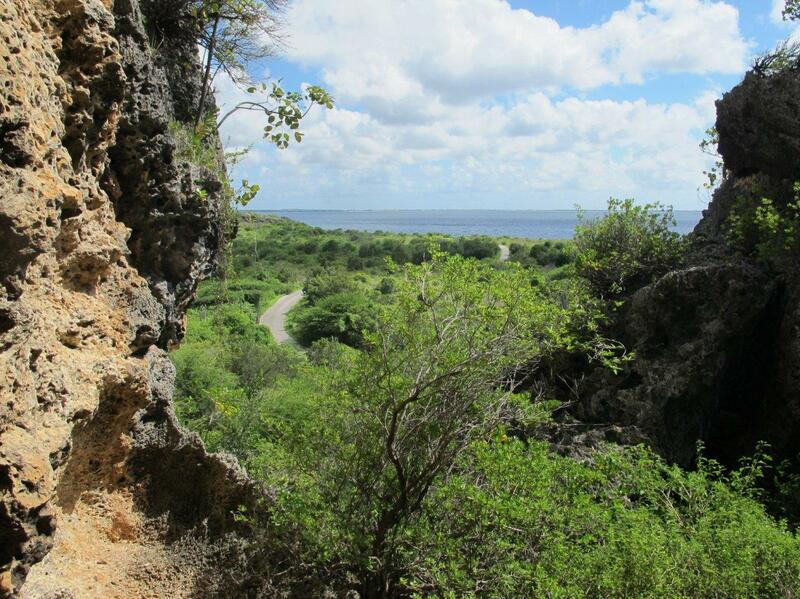 After winding up the hill we are rewarded with one of the best scenic views on Bonaire. The shallow Lake Goto is surrounded by green hills, has a number of tiny island and a slightly bigger peninsula. Of course we stop in the middle of the road and stare to indulge ourselves in this natural beauty. Then we go down where the road edges the lake. 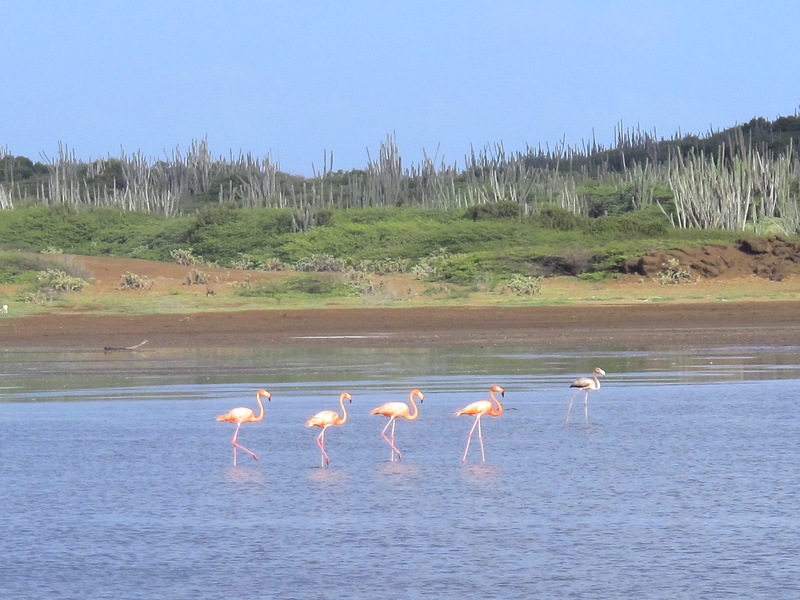 Usually there are plenty Flamingos here, but today they are off. Never mind, there are other places on Bonaire where we can see them. 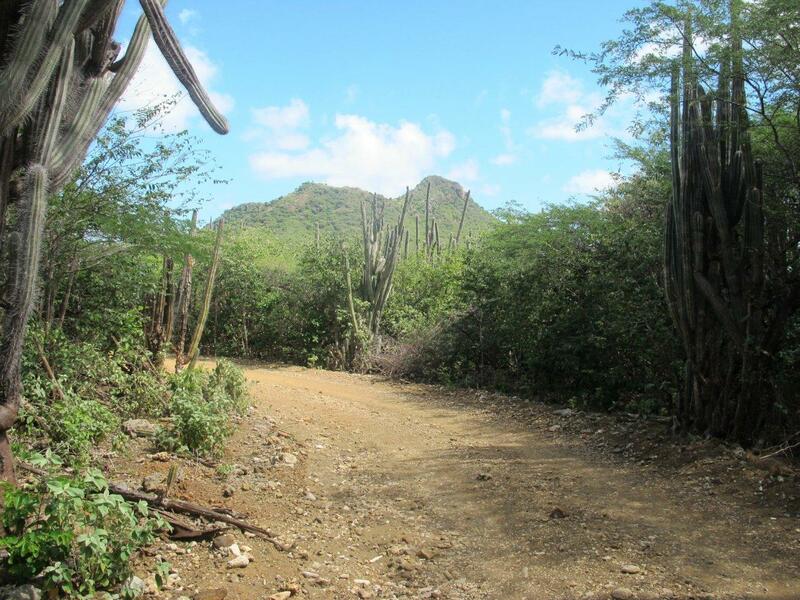 The road winds up again, toward Dos Pos, the two wells that used to provide Rincon with water. Rincon is the oldest village on the island. This is where the Spaniards settled, when they discovered the island 500 years ago. They kicked the Indians off the island, and, afraid that somebody would do to them what they did to the Indians, they hid their village in a valley. Invisible from the sea. It took the Dutch 100 years to find them and kick them of, but we did it. I am still proud of it. Rincon is a real local village. Riding downhill into it we know our reward is waiting for us. Rose Inn, a famous local place where we get ice-cold beers and a meal of Kabritu Stoba, the indigenous goat stew. When I bought my next door neighbor’s Yamaha Virago 750 motorbike, I never thought it would become my #1 favorite transport on Bonaire. I knew the weather on Bonaire is ideal for biking. 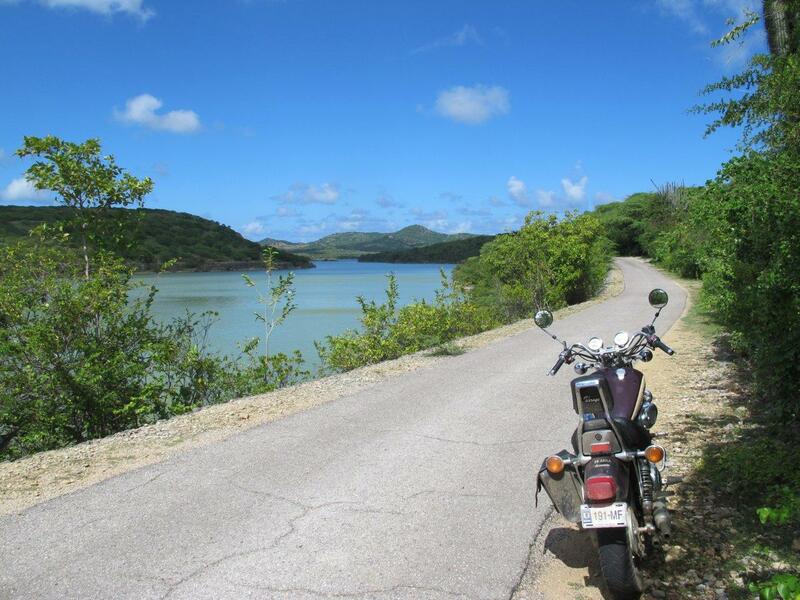 Temperatures around 30˚C/86 F, scattered clouds and constant trade winds make riding a motorbike a most pleasurable experience. Hence there are a lot of people on this island who own a motorbike. The Harley density is the highest in the world. But most of them only use their bike for touring. Not me! Although I do have a car, I use the motorbike whenever it’s possible. For visiting friends, for small errands, for going to the pub, anything. Of course I know there are fewer assured ways of decimating your life expectancy than riding a motorbike, especially when you do it without a helmet. But there still is no law against living dangerously on Bonaire, and nothing beats the feeling of the wind around your uncovered head. And I found there is scientific proof of the beneficial health effects of riding a motorbike. By the way, there is scientific proof of the beneficial effects of most unhealthy things we do. If you need a good excuse for the unwise things you like to do, I can highly recommend this article in the Guardian. Of course I love touring too. Nothing beats the unlimited panoramic view you have on a motorbike. But somehow I still need a special reason to do it. I found one when my girlfriend Ineke from Holland came over to spend the Xmas holidays. We meet a couple of times a year, but we never got to do a motorbike tour. Always too busy with plane rides and jeep safaris. You know, the ordinary stuff. 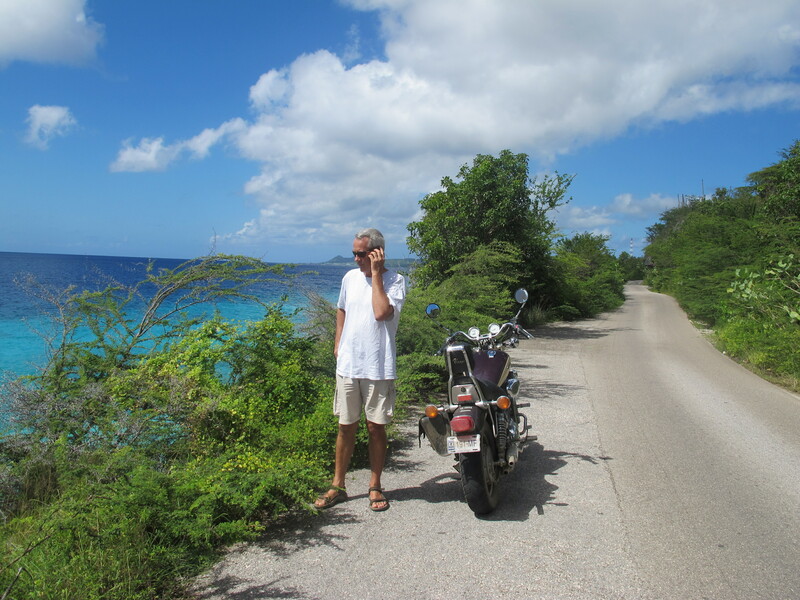 This time we decided to tour the tourist road on the Northwest side of Bonaire by bike. 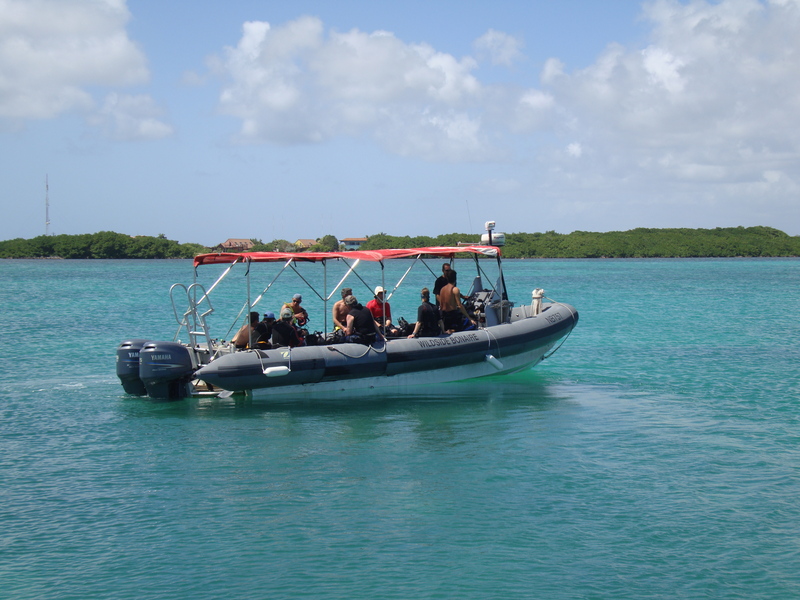 In my opinion it is the most scenic tour on Bonaire. You drive a well paved, narrow coastal road with a limestone cliff on the right hand side, the crystal clear blue water on your left. Wherever you stop and look over the edge you see stony corals and big male parrotfish grazing the algae off of it in the shallows. 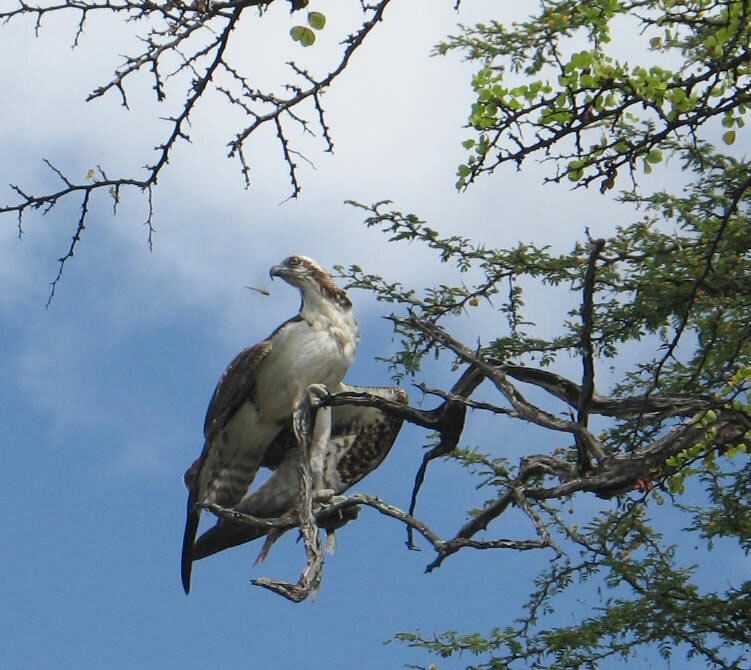 A dangerous habit: Osprey are waiting in the trees above and the daring parrotfish are an easy prey for them. One of the famous places to stop along the road is the 1000 steps going down a cliff. The name was given by divers going up with their heavy dive gear. 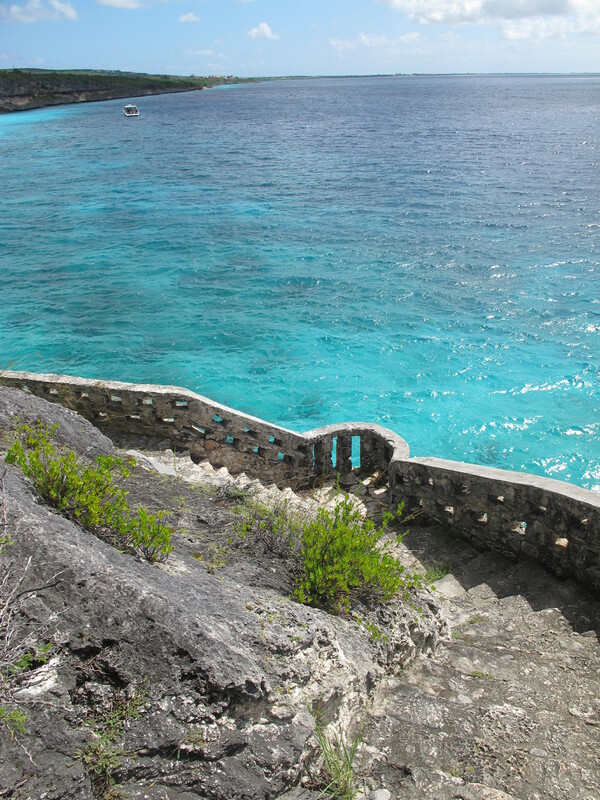 The 76 steps surely feel like a thousand when you are going up, a good reason to only dive the site by boat. But without the heavy load it is absolutely worth your while to go down and enjoy the scenery, go snorkeling, or just laze on the beach in the shade of the bushes. This time we just stopped and stared at the view, one of my favorite pastimes as you may have read in an earlier blog of mine. A bit north of the 1000 steps I wanted to explore a path I never walked before. It turned out to be a wonderful surprise. A walkway along the cliff, on the seaside of the road, giving surpr ising vistas on the 1000 steps site and more. A bit overgrown at places because apparently nobody uses it, but still very accessible. It made me wonder why I never tried this path before. It has everything I love. 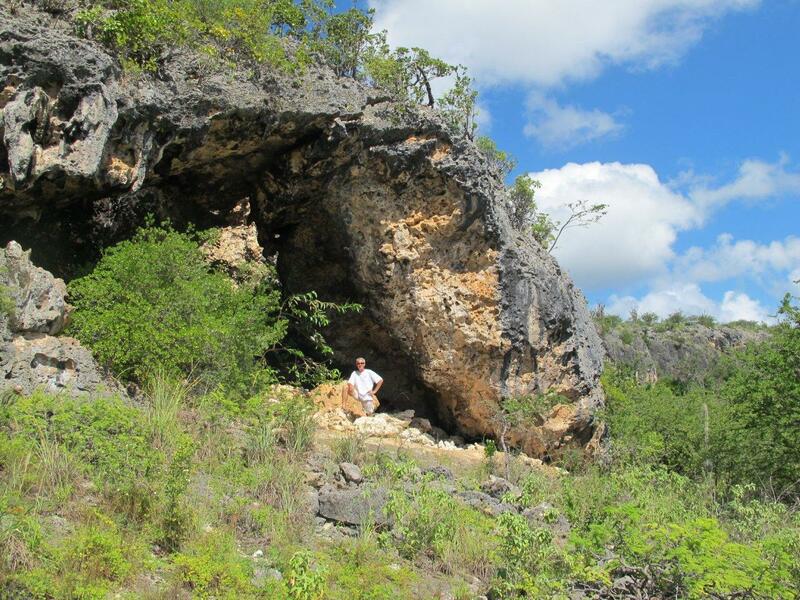 Beautiful limestone with crevices and caves, panoramic views, and the feel of purity. We spent quite some time there and took hundreds of pictures. But I knew there were other beautiful spots to come along the road. 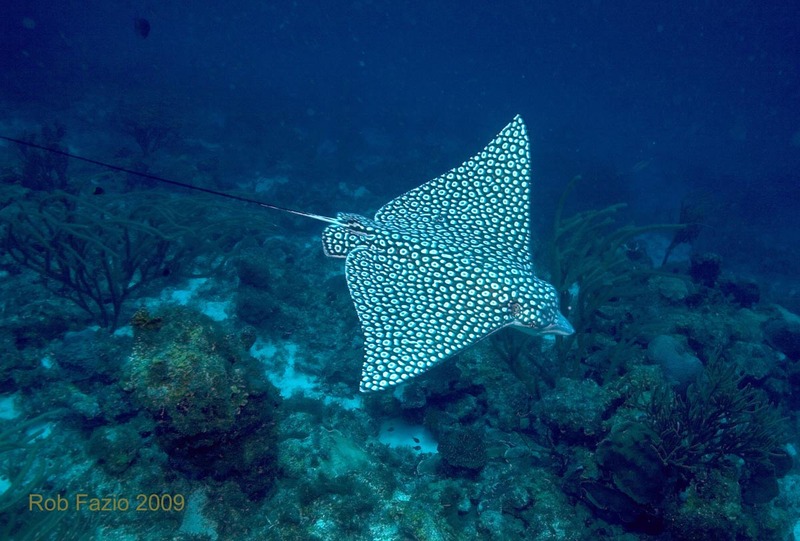 When I arrived on Bonaire nine years ago, I did not have a clue about marine life. I had lived in the Dominican Republic for a couple of years and became a dive master there. I loved my job and the island, but the diving there was just OK. A combination of worries about future liver problems (I worked in an all-in resort where we partied 7 nights a week) and the idea that diving would be better somewhere else, brought me to Bonaire. Up till today I’m not quite sure that I solved the virtual liver problem, but the marine life surely is a lot more spectacular here on Bonaire. 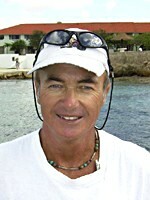 I was lucky to find a job at Andre Nahr’s Bonaire Dive and Adventure. 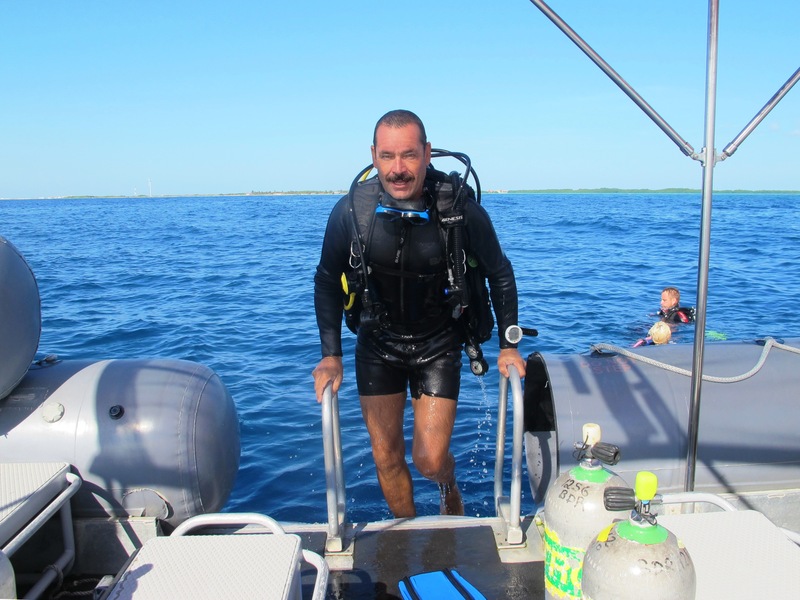 Lucky, because finding a job as a dive master is not easy on Bonaire, but especially lucky because an American guy named Jerry Ligon worked there. Jerry w as, and still is, a biologist who is just crazy about marine life. He is a walking encyclopedia on the subject, and he loves to teach. He told me that the geographical position of Bonaire, not far off the coast of Venezuela, gave it the most diverse marine life in the Caribbean. More than 500 different species of fish live around the island, and that’s a lot for this area. And although, like in the rest of the world, the corals are alarmingly declining, the reefs of Bonaire still are one of the healthiest in the Atlantic. Jerry pretends that he knows all 500 species, and I would not be surprised if that is true. He taught me all I know now about Bonaire marine life. Not all 500 species, mind you, but I think 60 percent is not a bad score. Jerry made me see the beauty of small things, and now my favorite way of diving and snorkeling is just hanging out and looking around me. The reef is a fascinating theatre with ever changing actors. The longer you look at one spot, the more you see. Jerry did not only teach me to identify fish species, but also showed me behavioral patterns in the water. 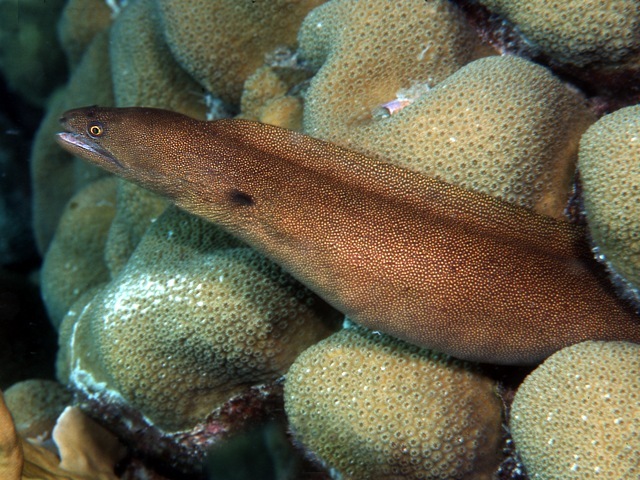 So now, when I see four or five Graysby hanging around a coral head, I wait until a Moray Eel comes out. An example of interspecies cooperation in hunting. 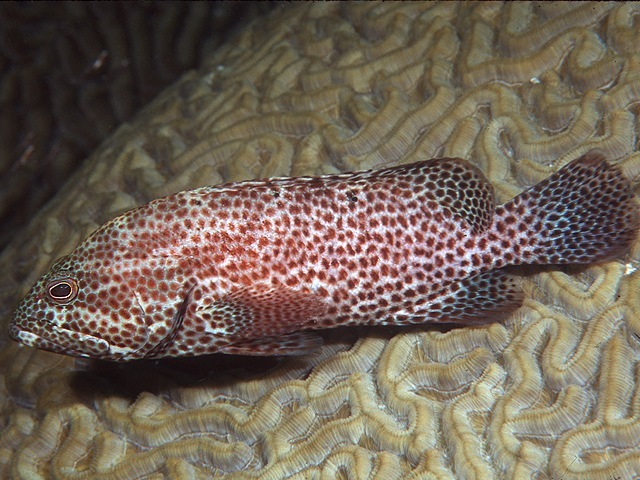 The more you know about marine life, the more you see when you are snorkeling or diving. I like everybody to be able to enjoy it, so now I teach about marine life too. With the help of the fantastic Reef Net interactive program ‘Reef fish ID’ I bore the guests of my apartment with my knowledge and show them the associated pictures on my computer. Taking them snorkeling or diving after the academic presentation is very rewarding. Even veteran divers and snorkelers see critters they never noticed before, and get enthusiastic to learn about marine life. Fortunately they all are tourists, so I don’t need to have competition fears. The pictures are taken from the ReefNet DVD. 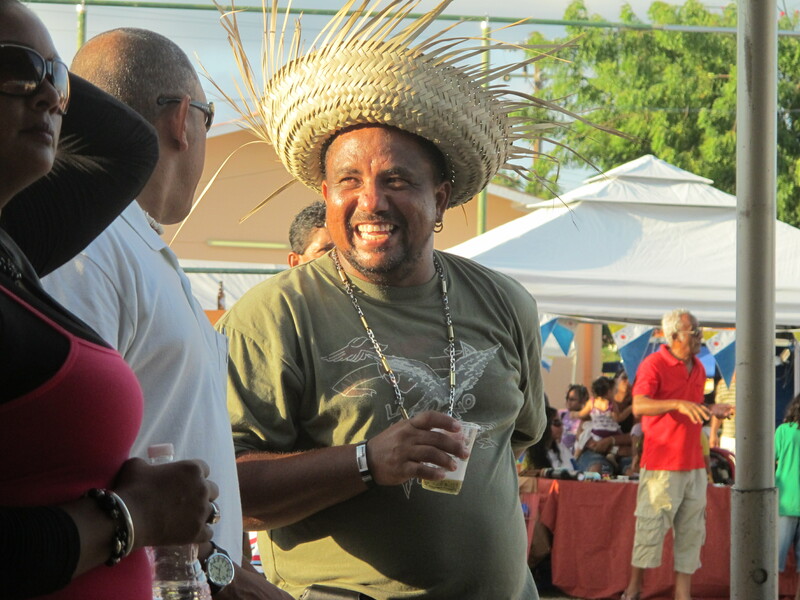 Every time there is an occasion to celebrate something on Bonaire, we do it. Big time. It is a Caribbean habit, Bonaire is in the region, and there is no exception to the rule. Each isla nd of the former Netherlands Antilles has its own flag, and that is a feat to celebrate each year. On Bonaire we have our Bonaire day, our Day of the Flag, on September 6. This year the celebrations were in the community centre of the Nort di Saliña area, next to the area where I live. It started at nine in the morning. I always skip the morning part of the celebrations since I am not into speeches, especially not here on Bonaire where officials excel in saying nothing with tons of words. So around two PM I started my motorbike and drove the three minutes downhill. There were quite a few people already. The friends I met told me that by skipping the morning program, I really missed out on something this time. A demonstration, with more than 500 people attending. 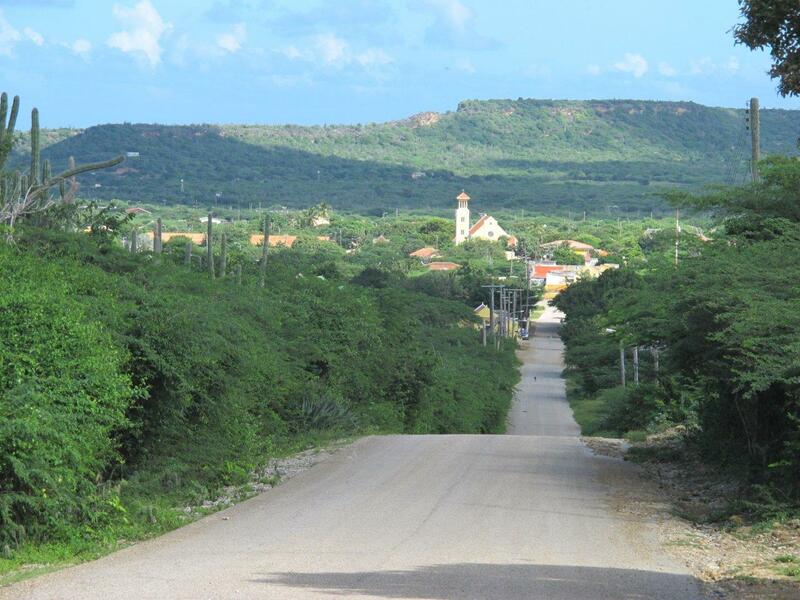 For you it may not sound like much, but for Bonaire with its 15000 inhabitants it is huge. This turn-out percentage in The Netherlands would result in a demonstration of half a million people! The demonstration was to show dissatisfaction, or even anger, with the affairs on Bonaire ever since the island became a part of the Netherlands 11 months ago. Bonaire now is the playground of Dutch civil servants. An avalanche of new rules washed over the island with devastating effects. The combination of a completely new tax code and exchanging the Antillean guilder for the American dollar resulted in a sharp rise in prices. Wages stay at the old level, so many people cannot make ends meet anymore. 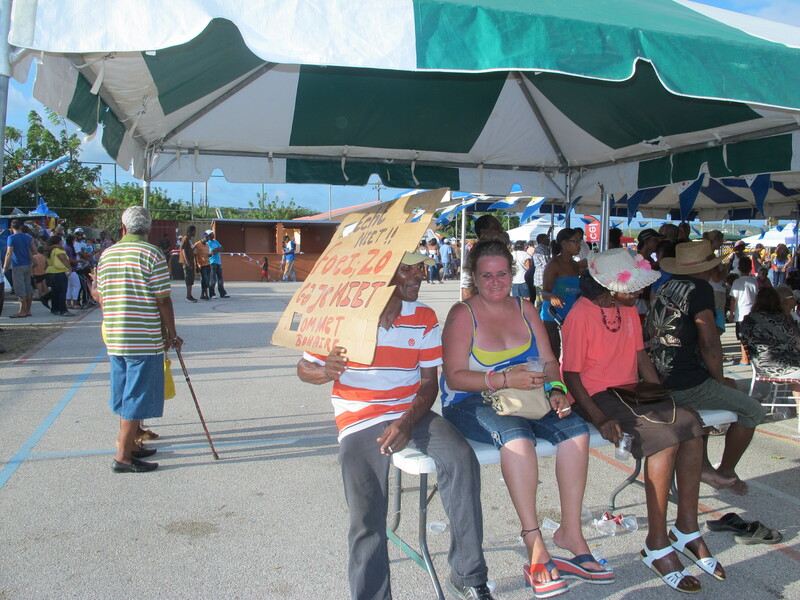 Still, Bonaireans are a kind and modest people and the demonstration had been orderly and peaceful. In the afternoon the festivities were not affected. Demonstration boards were used as sun shields (we are very practical on Bonaire) and the drinking, eating, chatting and dancing was as always when it is celebration time. Of course my Bonairean friends had me join in on the Simadan dance, where rows of dancers go back and forth. By now I know some of the lyrics and can join in on the singing part too. Around nine PM I went back home, exhausted. But then the guests who stayed in my apartment downstairs happened to come back home at the same time. They had missed the celebrations, not knowing exactly where it was. I could not let that happen, so the three of us went back to enjoy the last couple of hours. More drinking and dancing! Life is not easy on Bonai re.